The smash-hit comedy series Friends is now available in three new compilations, including birthday, wedding and baby themed collections. Compiling the best episodes from all ten seasons, these compilations make the ideal gift to mark life's special occasions! The One With All The Babies is a collection of hilarious baby-themed episodes from Friends! 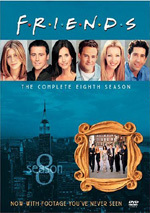 Before Warner Bros. put out full season sets of Friends, they issued some “best of” packages. Now that fans can buy all 10 seasons of the series, it’s back to square one! Eager to continue to pursue Friends-related profits, we now get themed compilations of episodes. Via The One With All the Babies, we look at four shows related to nuptials. I’ll offer brief discussions of each episode, listed in their broadcast order. The synopses mostly come straight from the package’s liner notes. The One With the Birth (Season One, 23:15) offered an “event” episode, though it managed to hold things back from becoming excessively lame. Carol goes into labor so everyone heads for the hospital. Ross competes with Susan for Carol’s favor while Rachel flirts with the doctor. The first two get stuck in a closet with Phoebe and almost miss the delivery. Joey runs into a pregnant single mother named Lydia and helps her through the process. Inevitably, the show became pretty cutesy at times. In addition, Joey’s “special moments” when he sees Lydia’s baby nearly made me gag. However, the show remained reasonably irreverent much of the time, which seemed like a success for this kind of program. It’s tough to create a good show with this theme, but “Birth” appeared acceptably winning. The One With the Baby On the Bus (Season Two, 25:07) occurs during a visit from Ross’ son Ben. Monica serves a kiwi lime pie, and Ross develops a nasty allergic reaction. While they rush to the hospital, Chandler and Joey look after the baby. They take Ben out for a walk to attract women, which lands them on the bus, where they accidentally leave Ben. In the meantime, the coffee shop owner hires a real musician to play Central Perk, which causes problems for Phoebe, especially since he makes Rachel tell her the bad news and deal with the aftermath. Guest star alert! “Baby” features cameos from Chrissie Hynde and former NBC actress Lea Thompson in a piece of cross-promotional synergy. “Baby” offers some good moments, but I must admit I feel an inherent disdain for this kind of guest star episode. It’s fine when the actor integrates into the show ala Tom Selleck later in the series, but these cameos come across like pointless gimmicks. The lost baby subplot seems a little weak as well. Weird element: Giovanni Ribisi briefly shows up as a guy who accidentally dropped a condom in Phoebe’s guitar case. He later appeared on the series as Phoebe’s half brother. I assume he wasn’t supposed to be that same character here, though since Phoebe doesn’t know many parts of her family well, I suppose it’s possible this was just foreshadowing for his later arrival. The One Hundredth (Season Five, 22:20): Phoebe is rushed to the hospital, where triplets are born. Joey gets hospitalized next – when his sympathy labor pains turn out to be kidney stones. As unsuspecting Rachel arranges a date for Monica with a male nurse. “The One Hundredth” suffered a little from “event episode-itis”, but it still managed to be a good show. “The One Hundredth” handled some potentially sappy moments well; Kudrow seemed especially touching and endearing as she popped out the kids and dealt with some postpartum sadness. Some of the gags felt forced, such as the doctor who loved Fonzie, but these weren’t too painful. However, I really couldn’t stand Ribisi as Phoebe’s brother. He’s one of the most affected performers around, and he seemed quite artificially and unconvincingly goofy as Frank. Kudrow’s oddball status appears pretty natural, but with Ribisi, it seems like you can always see the wheels turn, and his presence hurt the show more than anything else. Ultimately, “One Hundredth” had some good moments, but it wasn’t a great episode. Am I the only one who thinks new boyfriends/girlfriends on Friends should wear red shirts? They’re just like the Star Trek cannon fodder; they exist just to eventually go away. Mike did break that trend, but it’s hard to take him seriously, especially since Phoebe’s romances always tend to be annoyingly cutesy. Add a lackluster guest spot from Prinze and this is a so-so show. 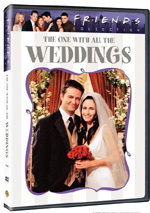 Friends: The One with All the Babies appears in an aspect ratio of approximately 1.33:1 on this single-sided, double-layered DVD; due to those dimensions, the image has not been enhanced for 16X9 televisions. This disc’s five episodes span the entire series’ run. That meant a lot of variation in picture quality. The Season One, Two and Five shows looked the worst. Sharpness was a definite concern. At best, the picture presented a reasonably accurate image, but only occasionally did I think it appeared especially crisp or detailed. Instead, the shows usually seemed mildly hazy and dull, without much clarity. Some shimmering and jagged edges appeared as well, but neither seemed too bad, and they decreased from the prior set. Distinct evidence of edge enhancement cropped up periodically. One improvement over the prior discs related to print flaws. I still saw occasional examples of specks, but these shows seemed cleaner than those from Season One. Colors often looked bland and drab. The hues maintained a muddled, brownish appearance much of the time, and while all colors showed problems, skin tones suffered the most. They alternated between excessive pinkness and a flat brownish look; both of them seemed unnatural. Black levels were a bit gray and blah, and shadow detail showed similar characteristics. Matters improved considerably for the two programs from Seasons Eight and Nine. Sharpness was mostly positive. A few slightly soft shots occurred, but none of these were terribly intrusive. The shows could have been a little tighter, but I was satisfied with their definition. Only minor examples of shimmering, jagged edges and edge enhancement showed up, and source flaws were rare. The programs could be a little grainy, and I noticed a few small specks, but that was it. Colors worked well. The show presented nicely vivid and bright tones, and the DVD replicated them concisely. Blacks also seemed firm and rich than in the past, and shadows were reasonably distinctive and not too dense. Because most of the material came from the earlier years, Friends looked spottier than I’d like, but the shows were watchable at worst and attractive at best. On the other hand, all 10 seasons offered pretty similar audio. Friends presented a Dolby Digital 5.0 soundtrack for which the scope and quality remained very similar through all the seasons. Dialogue dominated the episodes and remained oriented toward the front center. As always, music presented solid stereo presence over the front speakers, and the surrounds echoed the tunes moderately. The rear speakers added nice ambience in a few scenes like at the airport, in the park or at an arena, but otherwise the music was the main element from the back. As usual, audio quality was fine but not spectacular. The lines seemed concise and fairly natural, and they lacked much edginess or problems with intelligibility. Effects seemed acceptably accurate, but they never taxed the track at all. At least no problems occurred with those elements, and the music came across as pretty bright and bouncy. The rock-oriented score sounded clean and distinct, and bass response was tight and fairly rich. Nothing special occurred, but the mix rendered the audio appropriately well. Only a few extras appear here. As already noted, many of the episodes themselves include bonus footage. The amount of new material varies from show to show. I don’t know Friends well enough to recognize most of the new shots, but I think it’s cool that we get the uncut programs. In addition to a Best of Friends trailer, three audio commentaries appear. We get tracks for “The One-Hundredth”, “The One Where Rachel Has a Baby”, and “The One with the Male Nanny”. We hear from executive producers Kevin S. Bright, Marta Kauffman, and David Crane. The participants cover a mix of topics related to the series. We get some notes about the specific episodes themselves, and we also hear about general issues that deal with the show. For example, they discuss the development of the Monica and Chandler relationship as well as their thoughts behind various areas. The tracks suffer from a little too much dead time, and we also get too much basic praise, but they help elaborate on the show fairly nicely. During “Baby”, Kauffman offers good notes about how her own pregnancy influenced the story. If you expect a collection of the series’ best episodes from Friends: The One with All the Babies, you’ll walk away disappointed. The programs vary from good to mediocre and tend toward the mediocre range in general. The shows offered average picture and audio along with a few decent audio commentaries. If you just want a taste of Friends, you can go with this set, but I think the full season packages offer a much more satisfying way to examine the series.